New Directions Publishing Corporation, 9780811225199, 64pp. 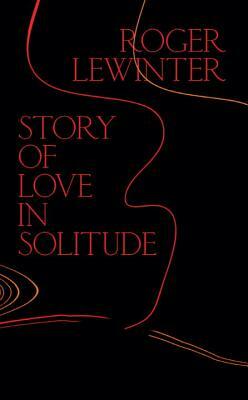 Several stories inhabit Roger Lewinter's first small book to appear in English, Story of Love in Solitude. Each story takes the form of a loop: a spider who won't stop returning; camellias that flourish and then die; dying parents whose presence is always yet felt; turning again and again to work on Rilke translations; a younger man whom the narrator sees each week at the Geneva street markets. All the tales touch on the possibility, the open possibility of love--a loop without end. Lewinter's short fictional works are at once prose poems and a form of dreaming; they are akin to the great French tradition of things sparking emotions and emotions sparking things--part Sarraute, part Robbe-Grillet, part Perec. Plot is not really the point of his meditative works. Lewinter concerns himself more with perception, apperception, and sudden inflections of grace: loss and beauty meet in an explosion of joy, which becomes, "in its brilliance, a means of transmittal."